You know that song, "I am a friend of God"...i use to really not like it. Not sure why, it just was one of those songs that rubbed the wrong way. Maybe it was that very part, saying, " I am a friend of God,"...I know Christ calls us 'Friends" but can i say I am a friend of God? A few days ago I saw a skit. A Man was sitting on a bench and several "friends" came by. He looked forward to each friend but each one came by either unfocused, busy, not engaging with their "Friend" on the bench, until the last one who actually sat down and had a real conversation with the Man. To those who drop me comments I want to say Thank You! The power of a word: it can give life or take it away. Kind words are like using multiplication in life, in love. So, Thank you to my "fellow Trekkers," it truly means so much! 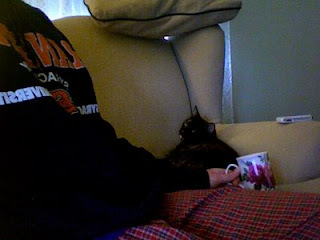 Hope you can see what this picture is - my kitty snuggled up in the corner of the chair I am sitting in and a cup of tea; both of which make rainy days so cozy! Here is my livingroom - the window treatments still need updating, the lace will have to do for now. The walls are "lunar Tide" a very soft green, a fresh green. Time flies. Here I sit on my comfy red couch, enjoying the new look of my living room - my dad painted last night after we worked all morning on stripping the wallpaper. I should have guessed he would have it painted by the time I returned from my night shift this afternoon. It looks GREAT - much better than the pink/peach walls with border and wallpaper. The trim is white - it simply looks softer and bigger. 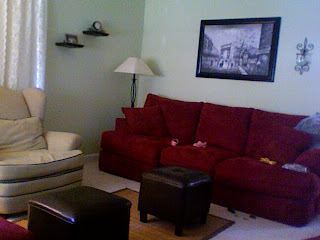 I still need to put window treatments up and hang pictures but i am happy with the way the paint turned the room around! I will post pictures later. I am also enjoying having my niece here for the night. 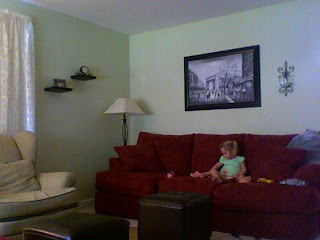 She is presently two - and very verbal. She is such a joy. This new phase of toddlerhood has come so fast! It seems just yesterday she was such a baby! Time does fly. My employer has been keeping two sweet kittens in her office for a few weeks. I had to drop by yesterday, to my joy and pleasure, i played with the little furballs for a few minutes before going next door to visit my chiropractor. As I was about to leave, I saw a bundle of children pass by the office window, I heard the kids exclaim "ohhhh, look! Kittens!" Wow - this is really good! These came from his work called "Christian Perfection:"
A few years ago a newer version of Charlotte's Web was released. I love this story and when i heard Sarah McLachlan singing this song in the T-day parade a month before the release of the movie, i was in love! I could NOT wait the see the new movie, nor could i wait till the release of the soundtrack - music has a way of grabbing my heart and this song did that! Still will we trust in God! Our eyes see dimly till by faith anointed. We find our peace again. And we are fools and blind. Our crown beyond the cross. Anyhow, here are some pictures of our work! We painted the utility room white and the shelves we painted a mocha coffee color - thanks to the OPPS discount paint at Home Depot it only cost me $10 for two gallons of mocho colored paint!